Stephen Oram is regarded as one of the premier craftsmen of near future science fiction. He is lead curator for near-future fiction at Virtual Futures and is on the writers’ panel for SciFutures (Sci-Fi prototyping for businesses). Oram’s stories often come from collaboration with scientists working on the leading edge of technology. He is available for interview. The follow-up to the popular Eating Robots and Other Stories (Nudge the Future Vol 1). The stories can be read in any order. The book contains a special section of responses from expert scientists,commenting on how the stories reflect the future of technology and humanity. 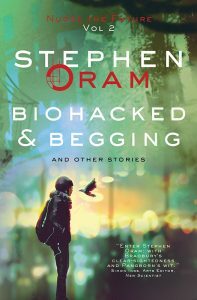 Immerse yourself in the future of biohacking and implants, genetic modification, blockchain micro-transactions and futuristic dating-apps with the author of Eating Robots, Stephen Oram. 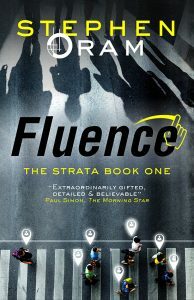 Stephen Oram writes social science fiction and enjoys working collaboratively with scientists and future-tech people – they do the science he does the fiction. He’s been a hippie-punk, religious-squatter and an anarchist-bureaucrat; he thrives on contradictions. 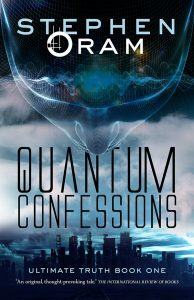 He is published in several anthologies and has two published novels, ‘Quantum Confessions’ and ‘Fluence’. 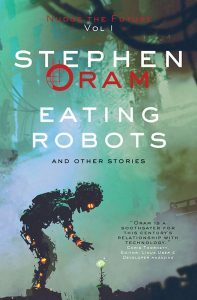 His collection of sci-fi shorts, ‘Eating Robots and Other Stories’, was described by the ‘Morning Star’ as one of the top radical works of fiction in 2017.